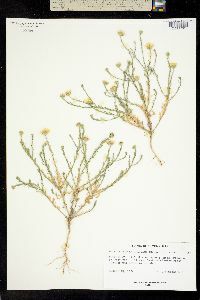 Xanthisma gracile (Nutt.) D.R.Morgan & R.L.Hartm. 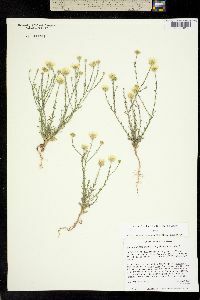 Annuals, 5-45 cm; taproots 2-5+ cm. Stems 1-15+, often branched at base or throughout, moderately stout to stout, not wiry, moderately hairy (hairs antrorsely appressed). Leaves: basal often withering by flowering, blades 20-60 × 10-25 mm, pinnatifid to 2-pinnatifid; cauline evenly spaced, blades obovate to oblanceolate (proximal), oblong to linear (distal 2 / 3 +), 4-10(-20) × 1-3 mm, markedly reduced distally, margins evenly serrate to serrulate, teeth 3-6 per side, each tipped with prominent white bristle 1.5-2.5 mm, faces moderately hairy (hairs antrorsely appressed). Peduncles moderately hairy (hairs fine, antrorsely appressed, straight to wavy); usually ebracteate. Involucres hemispheric, 0.6-0.8 × 0.8-1.3 cm. Phyllaries in 4-5 series, linear to narrowly spatulate, 2-7 mm, apices usually acuminate, sometimes rounded, tipped by white bristle, faces hairy (moderately antrorsely appressed hairs), sparsely and minutely stipitate-glandular distally. Ray florets 12-26; corollas yellow, tubes 2.2-3 mm, laminae 6-9.5 × 1-2.5 mm. Disc florets 50-100+; corollas 4-5 mm. Cypselae narrowly obovoid to oblanceoloid, 1.5-2.8 mm, nerves 24-28, faces sparsely whitish hairy; pappi whitish to tawny, 4-5 mm, bristles progressively longer adaxially. 2n = 4, 6, 8. Flowering summer-fall. Rocky to sandy washes, plains, slopes, roadsides; 300-2400 m; Ariz., Calif., Colo., Maine, Nev., N.Mex., Tex., Utah; Mexico (Chihuahua). 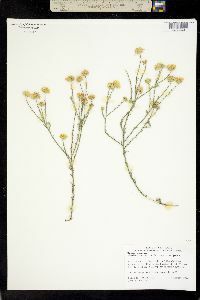 Xanthisma gracile is a species of the Southwest that has been introduced in Maine and possibly other eastern states. 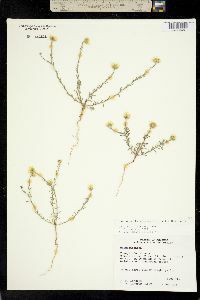 Xanthisma gracile is treated here in the broad sense, to include the n = 4 Haplopappus ravenii in addition to the n = 2 and 3 chromosomal races. According to R. C. Jackson (1962, 1971), the n = 4 race can be distinguished from the other two races on the basis of floret and phyllary morphology. 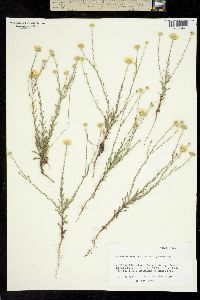 The former is said to possess fewer and shorter pappus bristles, shorter cypselae, and phyllaries that are covered by stiffer, more erect hairs. I have been unable to make this distinction with confidence. 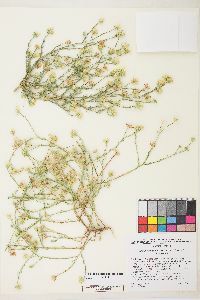 It is true that H. ravenii (based on specimens from its described geographic range, but not confirmed by chromosome counts) has phyllaries with often sparse, ascending to spreading hairs versus more numerous, longer, and generally appressed. Unfortunately, in surveying several hundred sheets of X. gracile in the broad sense, approximately twenty percent showed intermediacy in this character. Formal recognition of the n = 4 race has been questioned by A. Cronquist (1971) and others.